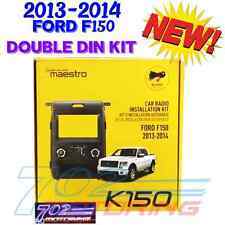 Dash kit for 2015 and Ford F150 and 2017 Super Duty. 2015 & Up Ford F150. 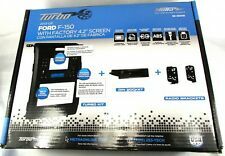 Install a New Car Stereo in Select 2015-18 Ford F-150/ F-250/ F-350/F-450/ F-550 Models with 4.3" "My Ford" Screen. F-150 "My Ford" Radio - 2015-2018. Installation Dash Kit for Single or Double DIN Headunits. Includes a storage pocket below the radio for single DIN mounting. Accommodates ISO Single DIN mount. Accommodates ISO Double DIN mount. Trim Plates for Single and Double DIN Stereos. Metra patented Snap-In ISO Support System Oversized under-radio pocket Recessed DIN mount ISO trim ring Contoured to match factory dashboard High-grade ABS plastic Comprehensive instruction manual All necessary hardware for easy installation FORD F-250/350/450/550 2005-07 Focus 2005-07 Freestar 2004-05 MERCURY Monterey 2004-07. Install dash kit for Double DIN/ISO Radios. Designed and manufactured with precision tolerances, resulting in a gapless fit between the dash and the kit. Designed specifically to match the Ford F-150 Lariat. SingleDIN Radio Provision. ISO DIN Radio Provision. Double DIN Installation Dash Kit for 2009-2010 Ford F-150 Lariat, for Non NAV Equipped Models. Double DIN Radio Housing. Double DIN Radio Housing Brackets. FORD F-150 LARIAT (NO NAV) 2009. FORD F-150 LARIAT (NO NAV) 2010. PAC quality and engineering provides you the most professional installation solution available! Includes everything you need for a professional installation with trusted PAC quality and superior finish. Double DIN Radio Installation Kit For Select 2011-Up Ford F-150 Trucks. Installation dash kit for Double DIN Radios. Includes a storage pocket below the radio for single DIN mounting. Accommodates ISO Double DIN mount. AX-ADFD01 2007-UP FORD Axxess ADBOX Harness. We are committed to providing you a quality product at the lowest prices possible. Painted High GlossApplications. F150 1997-1998. Expedition 1997-1998. Shaft radio provision. DIN radio provision. F-250 1998. Mounts aftermarket radio in console pocket location Recessed DIN radio opening ISO mount radio compatible using snap-in ISO radio mounts and trim ring Comes complete with harness that will provide all the connections to install an aftermarket unit using factoryspeaker power and ground wires Comes complete with built-in under radio pocket Includes harness . F150 1997-1998. Expedition 1997-1998. DIN radio provision with pocket. F-250 1998. IPod or other electronic device. IN 2015-17 FORD F-150. 75107-315 Ford F-150 (With or Without NAV) 15-17 J URL F. letting us know you are satisfied with it. That is why this line of vehicle specific mounts. IPod or other electronic device. IN A 2015-16 FORD F-150. 75107-316 Ford F-150 (With or Without NAV) 15-16 J URL F. letting us know you are satisfied with it. That is why this line of vehicle specific mounts. Dash Kit Product Details Car stereo requires a wired steering wheel remote input. 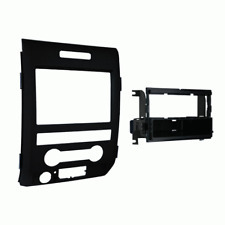 This Kit Contains Ford F-150 with factory 4.2" LCD screen 2013-up. Radio brackets. Radio trim panel. Antenna to Radio Adapter Cable. Fuse Holders. - Dash Kits. - Neon Lighting. - Installation Adapters. - Installation Harness. - Installation Interfaces. - Sound Damping. Empty Sub Boxes - Ford. IDATALINK KIT-FTR1. Allows you to install a double-DIN radio in your Ford truck (also requires the Maestro ADS-MRR module). Amplifier Install Kit. Includes dash kit, wiring harness, and other wiring. Installation Accessories. METRA 99-7862 HONDA ACCORD 2003-2007 SINGLE DIN STEREO DASH KIT WITH POCKET. Ford F-150 2013-14 w/ 4.2 Screen ISO DIN Radio Provision with Pocket. DDIN Radio Provision. XSVI-5524-NAV – Ford 11-Up Accessory Retention Harness. AX-ADFD02 2011-UP Ford AxxessADBOX Harness. IPod or other electronic device. IN A 2013 FORD F-150. 75107-309 Ford F-150 (With or Without NAV) 09-12 J URL F. letting us know you are satisfied with it. That is why this line of vehicle specific mounts. Installation Dash Kit for Single or Double DIN Headunits. Includes a storage pocket below the radio for single DIN mounting. Accommodates ISO Single DIN mount. Accommodates ISO Double DIN mount. Compatible Stereo Size Single & Double DIN. Install a New Car Stereo in Select 2013-14 Ford F-150 Models with 4.3" "My Ford" Screen. IPod or other electronic device. IN A 2009 thru 2012 FORD F-150. 75107-309 Ford F-150 (With or Without NAV) 09-12 J URL F. letting us know you are satisfied with it. That is why this line of vehicle specific mounts. CERTAIN 1997 thru 2004 F150's. Ford F150 - AT, w/o ACC 97-03 C B F. Ford F150 - Super Cab-AT, w/o ACC 01-03 C B F. Ford F150 Super Crew-AT, w/o ACC 01-03 C B F. iPod or other electronic device. 1997 thru 2000 FORD F-250 or.